July is about halfway over and so is the Journey to Splits challenge. For about two weeks now, I’ve been doing the five foundation stretches plus the stretch of the day, holding each one for a minute (per side, if applicable). And if you follow me on Instagram, you know my dogs have become my biggest fans/supporters. Nothing like having your face licked while you’re trying to pull your leg toward your head! I thought I would share my observations/learnings on this 30-day journey so far. My boys are always there to cheer me on! 1) My left leg is more flexible than my right. Which is interesting because I am right-side dominant. Or maybe it’s not interesting and makes perfect sense. I don’t know, but it’s true. 2) I’m grateful and annoyed by the Instagram connection. It’s cool to be able to easily find others doing the same challenge as me, and to have them find me and leave supportive comments on my daily pictures. But in some people’s “before” pictures, they’re already in a full split. They don’t “need” this journey like some of us do. Doesn’t mean they’re not welcome, of course. But do you have to rub it in? 3) There is apparently a stretching plateau. And I think I hit it around day 10. It’s harder to motivate myself to do the stretches and I feel like I’m not making any additional progress. My hamstrings just hurt and I’m pretty sure my back rounds more than it should. 4) After I get over my childish moments, I am grateful for the Instagram connection. 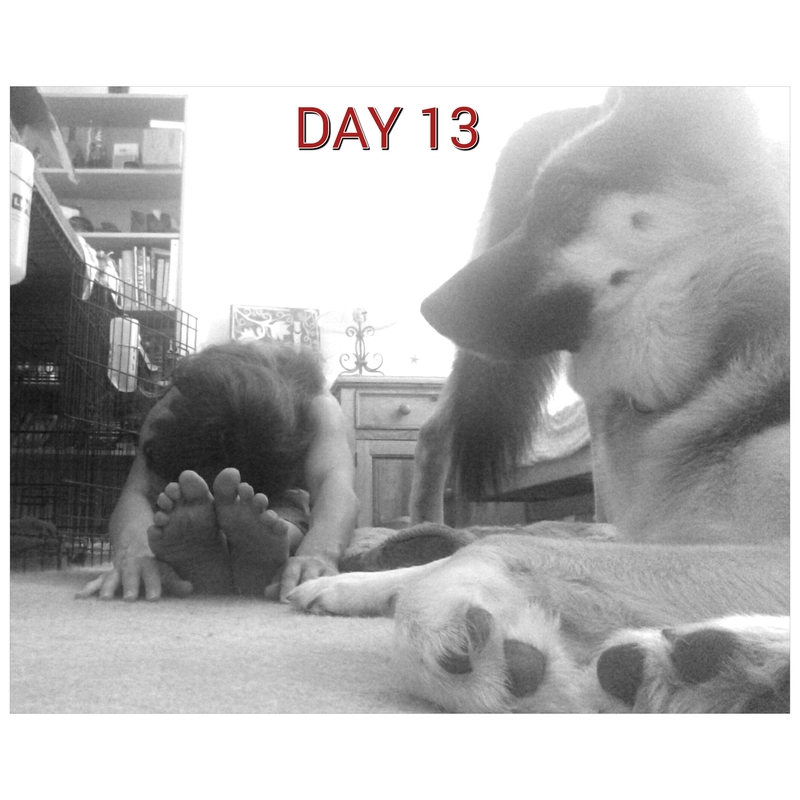 It keeps me accountable because I know I’m expected to post a picture every day of the daily stretch. And I’m too honest to post a picture without doing all of the stretches I’m supposed to do. So it helps me force myself to do them, even when I’m not feeling motivated. 5) I am making progress. Even though I feel like it’s slowed way down in the last few days, I am definitely able to go deeper in the stretches than when I first started. I’ve lost some of my initial enthusiasm for this challenge, but I’m still pushing through. It happens, but the important thing to me is to not give up just because it’s getting harder. So keep watching Instagram. I promise I’m going to finish what I started! Sounds like some good progress!! This is one of my goals too–I started it at the beginning of chemo but had to stop because it was too difficult with treatment. But as soon as I finish this journey–back to splits I go! Keep going! I want to get there, too. I was on my way when I injured my foot. Soon.